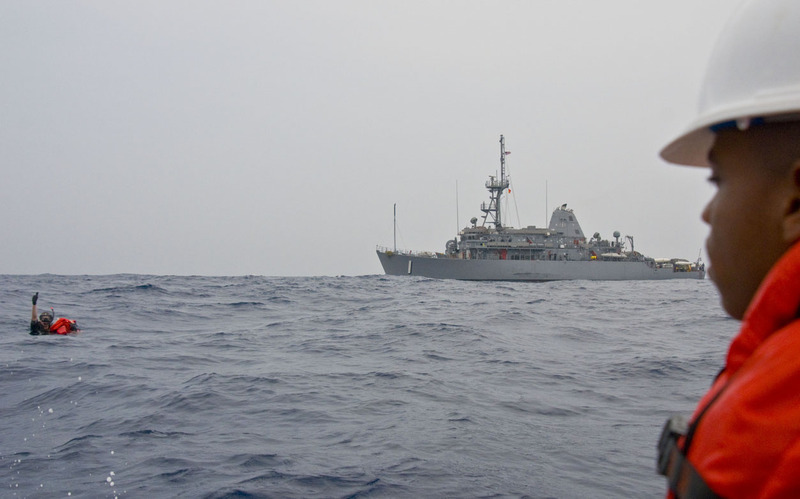 It’s no surprise that the USCG and BoatU.S. urge boaters to equip and train for a man overboard emergency. This comes from knowledge of man overboard statistics. When least expected, it can happen …What if it happens to you? Will your shipmates be ready to mark your fall overboard? Will they be able to pull you back aboard? MOB survivors will tell you getting back onboard is not easy! New man overboard gear and methods can greatly improve your odds of rescue. Your proactive decision can increase the likelihood of positive outcomes on your boat and make recovery as easy as possible. Read on for the surprising numbers and full story. The BoatUS Foundation compiled statistics on USA boating fatalities from 2003 through 2007. Chris Edmonston, President of BoatUS Foundation, reported that, of 3,133 boating fatalities in the five years, 749 were MOB deaths. Here is a synopsis of the BoatU.S. MOB findings. This data comes from the October/November 2012 issue of BoatU.S. Magazine. It provides some good information on man overboard. The products we represent came to market about the time this was written so are not reviewed in it. With the unfortunate 90% rate of MOB deaths in calm seas and wind, it cannot hurt to be prepared with the best man overboard equipment and training, even if you don’t think you need it. Michael J. ( Mike ) Baron, USCG Boating Safety Division, wrote about 2011 MOB statistics on the Boating World site. He cites 205 deaths from 359 falls overboard in 2011. 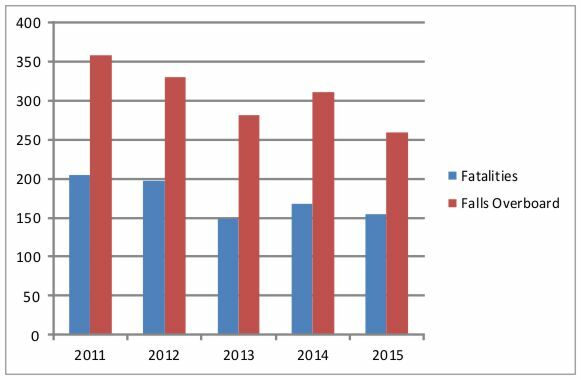 This image shows falls overboard and MOB fatalities for each year from 2011 through 2015. A study recently published in Wilderness & Environmental Medicine has found more fatalities from boating than from snow skiing or football.3 They analyzed injuries and fatalities on sailboats from 2000–2011 using USCG data. Andrew T. Nathanson, M.D, one of the Rhode Island Hospital researchers, commented that, Neither experienced nor novice boaters were spared from injuries and death. They found higher fatality rates in boating than in alpine skiing and snowboarding, or American football. When you evaluate a new man overboard pole, we think you will come back to buy one of our dan buoys. Take a look at our entire line of man overboard gear. Taking the time to train for man overboard, and investing in the best man overboard gear, will increase the likelihood of a positive outcome on your boat. What steps do you take on your boat about dealing with a man overboard? I have come to think everyone needs to wear a PFD anytime we are underway. I always wear a belt–pack PFD whenever, whereever, when underway. I have gone overboard several times, just getting on or off my boats, not even underway. Each time I went over, I was doing something which, if I had stopped and considered my actions, I would have done differently. I am 73 with 60 years of boating experience, a retired TOWBoatUS operator, with hundreds of yacht deliveries/tows. Just last fall I went overboard between my trawler and the pier while carrying a 5′ ladder. The ladder snagged on something, then pulled me off balance. I had not snugged the boat up close to the boarding ladder, as I usually do. I could have put the ladder aboard first, thus freeing up both hands. That’s hindsight! With all my clothing on, tools in pockets, shoes, brackish water, time around 1730, nobody around, end–of–day tired, treading water was difficult. I worked my way from amidships around to the stern swim ladder. I was just able to reach and pull it down, but it hung up on the pier by several inches. As I was hanging on the horizontal ladder, the boat slowly crept forward so the ladder dropped down to the vertical position, hung up on the crossed stern lines. I got those cleared so I could climb out. I now have a line tied to the swim ladder so it can be pulled down from in the water. I also installed a dock ladder aft of my boat, deployable from the water. I now have it firmly in my mind to snug the boat over while going on/off, to put items onboard before stepping aboard. I will not go into the thoughts that went through my mind while I was in the water. I am not too proud to admit that this fall overboard really scared me, I believe for the first time. Hopefully this happening will benefit other folks. See our Recovery Ladder with mesh sleeve which keeps it tidy and available to help get an MOB back on board. Hard to foresee the ladder catching on a cleat on the dock as you carried on, throwing you off balance and into the water. Good job taking the time to reflect on the misadventure and share it so those interested can also learn from your experience. Some occupations which involve waterfront work require workers to wear a PFD.